This guide outlines how to build a project for a Windows Phone device or the emulator. 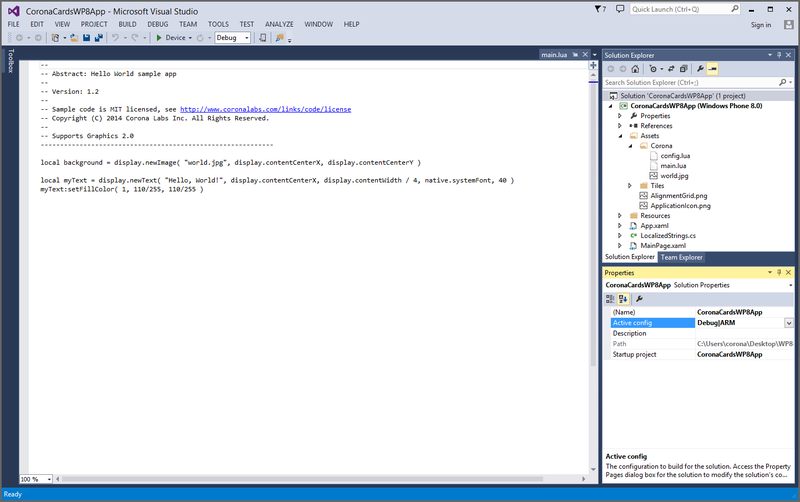 In Visual Studio, view the Solution Explorer panel. Click the root Solution item in the project tree. In the Properties panel for Active config, select either Debug|ARM or Release|ARM. Connect a Windows Phone device to your PC via USB. Power on the Windows Phone and unlock the screen. In the upper toolbar, directly to the right of the green arrow (▸), select Device and click to compile/run your application on the device. If the device has not been registered for development, Visual Studio will display a deployment error. To unlock the device for development, run Microsoft's Windows Phone Developer Registration application. In the Properties panel for Active config, select either Debug|x86, Release|x86, Debug|Mixed Platforms, or Release|Mixed Platforms. Note that the Mixed Platforms options are normally not available unless you add another .NET project to your solution. In the upper toolbar, directly to the right of the green arrow (▸), select one of the Emulator... options and click to run your application in the emulator.